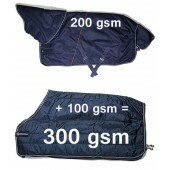 The Quagga turnout Is waterproof and breathable, with a QUAGGA DRY lining system to ensure your horse will be comfortable whatever the weather. Quagga stable rugs are designed to keep your horse comfortable in the stable. 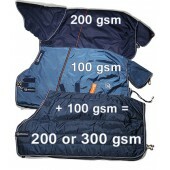 They are made of a rip-stop texturized polyester outer shell, filled with 200g of bonded fiberfill along with the additional comfort of QUAGGA DRY lining fabric. The QUAGGA DRY lining system gives the rug the additional benefits that you expect from Quagga rugs, wicking any moisture away from the horse and antibacterial coating. 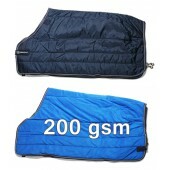 Why not add extra warmth to your Quagga turnout, by pairing it with a Quagga underlayer? The Quagga underlayer system allows you to choose the level of warmth needed for your horse in the changing weather conditions. 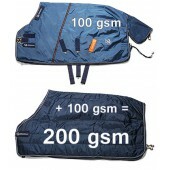 Breathable interchangeable underlayers attach securely to Quagga turnouts and Quagga stable rugs at the neck and tail strap. Available in 100gsm and 200gsm weights, these underlayers will keep your horse turned out or stabled at the appropriate weight for the changing weather. 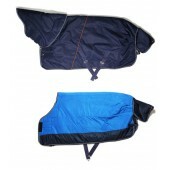 The Quagga underlayers use velcro and snap closures to allow you to attach to either a turnout or a stable rug. 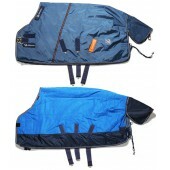 These interchangeable underlayers are fully breathable with QUAGGA DRY lining system and an anti-bacterial coating. The QUAGGA DRY lining system uses wicking stay-dry materials, applied to our turnouts, stable rugs, stable sheets and underlayers. This coating includes an anti-bacterial coating for up to 25 washes, where the fabric that has been chemically treated by incorporating the anti-bacterial chemical agent into the fiber formula, making the finished fabric resistant to, or inhibiting the growth of micro-organisms.